Growing up, Amer always felt in his heart that he wanted to become a civil engineer. Sadly, because of the Syrian crisis he was not able to fulfill his dream. The EDU-Syria scholarship at Zarqa University enabled him to pick up his dream and make it a reality that he excelled in accomplishing! Amer graduated last week and was ranked first in his college. His graduation project got third place in “Mubadron” competition at the national level. 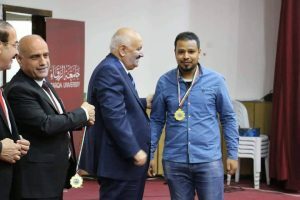 As a result, the university honored him for his great achievement, especially for his excellent academic performance in his major civil engineering. “This major was not only my own dream but also my fathers’ dream. And now I have another dream, it is to contribute in building the future of my homeland SYRIA.” Finally, he would like to thank EDU-Syria and everyone who helped him in reaching his dream. We wish Amer a bright future!